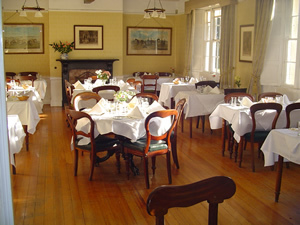 Hunter's Hotel is open every day for Breakfast, Morning Coffee, Lunch, Afternoon Tea & Dinner. Lunch (served from 1.00 p.m.- 2.30 p.m.) from €22.75. Afternoon Tea from €18.50 served from 4.00 p.m.- 5.30 p.m.
Two sittings 12.45 p.m. and 2.45 p.m.
Dinner from €30.75 2 Course, €38.00 3 Course. Saturday Dinner €49.75 Served from 7.30 p.m.until 8.45 p.m.